The following article appeared in Book-Lore in May 1887, and proves that nothing much changes in the world of book collecting. LORD LYTTON, in that curious and mysterious novel, Zanoni, mentions an old bookseller who, after years of toil, had succeeded in forming an almost perfect library of works on occult philosophy. Poor in everything but a genuine love for the mute companions of his old age, he was compelled to keep open his shop, and trade, as it were, in his own flesh. Let a customer enter and his countenance fell; let him depart empty handed and he would smile gaily, oblivious for a time of bare cupboard and inward cravings. A purchaser was indeed a deadly enemy to the old man, for every proffered coin was scorching hot, a miserable and inadequate exchange for one drop of purple blood. It is astonishing what a deep interest some people take in weird and obscurely written books. They will gloat over the mysteries of Hermes, and nervously finger the pages of Agrippa, that foul magician whose judgment of himself and all his labours is so eloquently portrayed in his Vanitie of Arts and Sciences. No matter, says the devotee, Agrippa was mistaken; he was afraid of the Inquisition, and recanted. He could not have invented the sigils, triangles, and magic circles, without which congregated with horrid eyes the spirits of the Moon and Paymon, the King of the West Wind. Agrippa was afraid of the spectres he had raised; afraid of his own black dog, and of the hell to which it pointed. The amateur occult philosopher is, however, not afraid as yet and every spare moment is occupied in ferreting out the names of ghostly men, who either suffered on the rack or at the stake, for leaguing themselves with the powers of the air, or else tumbled headlong into the talons of besieging hosts of devils, all screaming, as Paracelsus says they sometimes do, " Thy pentacles and thy circle are wrong, thy words are false; come thou with us." The old bookseller was a type, and, as we think, a type only of Lytton's own creation; perhaps a reflection of the soul of Lytton himself, ever groping through mists of tale and fable, and ever unsatisfied. The purchaser of works on occult philosophy is usually exceedingly enthusiastic, so much so that he persists in his so called studies, notwithstanding the fact that nine tenths of his books are in Latin, a language of which he knows little or nothing. In a few words, he would become a disciple of Jannes and Jambres, and to this end sets about accumulating materials in the form of huge folios, conscientiously intending, no doubt, to read them when time and opportunity offer. His course of reading so far has been confined to the Strange Story, which first riveted his attention on fiends and spectres, and to Barrett's Magus, which, being in English, and adorned with a number of weird plates, has proved an excellent stimulant to further exertions. The Bible is ransacked, and the Witch of Endor and Simon Magus duly weighed in the balance, while such phrases as "Now the magicians of Egypt they also did in like manner with their enchantments," roll off the tongue with unctuous volubility. Presently the aspirant to "horrors fell and grim" stumbles across the treatises of Raphael and Sibly, and sighs to think that his ignorance effectually cuts him off from the delightful contemplations of those obscure authors upon whose diatribes their works are founded. At this point the average student comes to a full stop, and turns probably to astrology as being a more tangible study, and apparently much easier. His little library swells with the treatises of Lilly, Raphael, Placidus de Titus, and the great Ptolemy, while he rejoices to think that Flamsted believed in the reality of the science, and that old Burton, the "Democritus junior," hanged himself rather than admit that his own horoscope was out of gear. The next step is the purchase of a planisphere, which conveniently dispenses with abstruse calculations in spherical trigonometry ; and finally the student erects a horoscope all out of his own head, showing plainly enough that he was born when Mercury was retrograde, and at the square of the moon a never failing sign of idiocy, proved up to the hilt, be it said, when he is at last actually persuaded to go a horse racing with his slender capital, merely because the "quesited" the famous "Flying Scud" is in a trine aspect with Jupiter, Lord of the Seventh, and therefore cannot lose. The horse, however, breaks down, and is scratched four and twenty hours after the money is staked, and henceforth astrology is a Will o' the wisp that will never again lure our bibliophile to his ruin. Out of every twenty persons who take up the study of occult philosophy, nineteen are supremely ignorant of the most ordinary branches of knowledge, but the twentieth is a man of very different composition. He, too, began, perhaps, in the same way as his less gifted brethren, and has followed the same paths, and pored over the same books, and would like also to rival the deeds of Albertus Magnus, who had power over the elements; or of Peter of Abono, who raised terrible forms as easily as a market gardener raises cabbages. He speedily discovers that Barrett's Magus is, in part, at least, a mere translation, and a very bad one, of Agrippa's fourth book, and that Raphael has mutilated the words of every author he quotes. There is no reliable work in English which can possibly be procured, and so he turns to the Latin, beginning with Iamblichus, and his famous book De Mysteriis, printed by Aldus in 1497. This rare and interesting specimen of typography loses, however, all its beauty in the absorbing nature of its contents; and the same observation is applicable to the author's Vita Pythagorae, published at Rome in 1556. These treatises are, it is true, mere introductions which every tyro who hopes hereafter to lift the veil of Isis must read if he wishes to fit himself to meet the petrifying gaze of the "Dweller on the Threshold;" but they are also two most useful books, as from them can be gleaned a mass of information which, rightly understood, is declared by the initiated to point to the portals of the world beyond the grave. With appetite whetted to a swallowing point perfectly gluttonous in its magnitude, the student next turns to the treatise of the learned Jesuit, Martin Delrio, who, in his Disquisitionum Magicarum, examines the many different systems of magic practised by the professors of his day; to Bodinus, De la Demonomanie des Sorciers; and in their turn to Boissardus, Jerome Cardan, Glanvil, Grillandus, Van Helmont, Wierus, and the Malleus Maleficarum of Sprenger and Institor. All these works, comprehending as they do an assortment of wonders the like of which the world never saw, and perhaps never will see, support one another in a manner that would put a coterie of Old Bailey witnesses to the blush, so precise, and seemingly accurate are the expressions used, so consequential the inferences. There is no mincing matters, no equivocation nor contradiction; everything is so orderly and precise that what is usually regarded, in this country at least, as a structure composed entirely of falsehood and fraud, becomes quite natural in appearance, so that, at last, the student finds himself accepting a statement, no matter how foolish, simply because Sprenger affirms it to be true, or Robert Fludd hints that it possibly may be. All this time money is going out as fast as credulity, for works on occult philosophy are very expensive. The dealers are aware of their patron's feverish anxiety to obtain them when once bitten by the mania, and, as a matter of course, charge accordingly. Thus £3 is, as a rule, demanded for the Opera Omnia of Paracelsus, 1658, 2 vols., folio; seven or eight guineas for the collected works of Cardan, Lugd., 1663; and as much and more for those of Robert Fludd, Oppenheim, 1617. Respecting this last author, Isaac D'Israeli, in his Curiosities of Literature, states that in his time as much as £4o had to be given for a single volume, so great in those days appears to have been the anxiety to obtain copies of works of this and a similar class. We can imagine, therefore, how large must have been the value of the unique collection formed by the bookseller to whom Lytton so fondly refers, and we or at least some of us - may almost participate in his disinclination to have such a splendid assortment broken in upon by the amateur peripatetic philosopher who in all probability cannot read one hundredth part of the treasures he longs to possess. The modern world has now been revolving for nearly 1,900 years, and during the whole of that time repeated attempts have been made to lift the curtain that shuts out the invisible world. Some few persons as, for example, Rozencrantz, who founded the Society of the Rosy Cross, and Paracelsus, who is "now living in his tomb, whither he retired disgusted with the vices and follies of mankind" are credited with having peeped for a few brief moments behind it; but with these and some other exceptions the progress that has been made is admitted by the most ardent devotee to have been nil. Rumour, as chorus, has taken the place of fact, and dreams that of reality, but still the modern occultist cannot be brought to see that he labours in vain. And so he goes on purchasing ponderous volumes, ugly to look at and absolutely useless for every purpose, theoretical as well as practical, until either he is forced by repeated failures to admit that his favourite authors are impostors, or that he himself has, in spite of all his application, failed to reach the road that leads from this world to that which is to come. He and others like him and there are many even in this century would outstrip themselves in a desperate race through the darkness of Erebus; they spend a lifetime in learning to walk, only to be afflicted with total paralysis at the last; and when they awake to find their labour has been in vain, they are amazed to think of the fallacy which engulphed years of toil in the futile attempt to discover what they will learn in five minutes after they are dead. However, be this as it may, the sale of books on occult philosophy goes on apace, and purchasers are very eager to part with their cash, a phenomenon which is observed in very few instances save the one under discussion. Some of these days enterprise may detect money in new editions and translations of Artemidorus on dreams, and Raymond Lully and Artephius on the philosopher's stone; but at present the trade is confined exclusively to old and battered copies which have served generations of investigators, which are now being read, and which will be read, in all probability, until they are thumbed out of recognition. It is said of the Emperor Nero, that among other studies he ardently followed that of magic. He employed immense sums, wrung from the sweat of Rome, in this pursuit; searched far and wide for professors, penetrating the remote regions of India and Africa, and even prowled among the ruined towers of Chaldaea. Rewards were offered, and threats of cruel torture not only lavished but carried into effect, and with what result? Absolutely none, for all the power of Rome could not raise up another Witch of Endor, nor prolong the Emperor's life for a single second. And yet there are in England at this moment thousands of busybodies who think they can, with their limited resources, accomplish what Nero, with all Rome at his back, failed to perform; and so they go on, blinking like owls over distressing paragraphs that no one either in heaven above, nor in the earth beneath, nor in the waters under the earth, can possibly construe into intelligible English. The only consolation is that these good people are out of harm's way, and may perhaps be laying up a store of patience which may serve their end when the fit is over. They are very good customers of the booksellers also, and rejoice exceedingly over one very small piece of silver which they persuade themselves they are on the eve of finding. Alan Odle is one of the last of the black-and-white artists of the early 20th century to receive proper attention. A friend of Harry Clarke and John Austen, his work was particularly admired by H.G. Wells, Claude Houghton, John Cowper Powys and James Hanley, all of whom were fervent in praise of it. He is perhaps most known for his copious grotesques for The Gypsy, the short-lived journal (two issues, 1915 and 1916) edited by Henry Savage (which also published work by Arthur Machen): but he also made designs for a few books and journals, including illustrations to Blackwood, Le Fanu and Poe for the short story magazine The Argosy. His master work was to have been an illustrated Rabelais, but this was never completed and the designs he had done have been dispersed at auction. In recollections of friends, Odle appears as a highly unworldly man, more spirit than mortal, devoted to his art, and often described as "luminous". He was sustained for many years by his marriage to the novelist Dorothy Richardson, who looked after him and often diverted her own work to earn enough to keep them - Odle's art was too strange ever to sell well. These and other insights come from a most welcome new study, The Life And Work of Alan Odle by Martin Steenson (Books & Things, Stroud, 2012, 126pp). This includes a biographical essay, an excellent bibliography, letters from Odle (these were rare, but long and characterful) and about him, and a generous selection of plates of his work. It is a highly fitting tribute to an artist of high originality. At first under the influence of Beardsley, he soon found a unique intricate style to express his bizarre visions, which led one critic to exclaim: "His extravaganzas are so steeped in grotesque coarseness that they would be intolerable were it not for the entrancing beauty of his pen-broidery with its easy flowing, swinging rhythm and sensuous richness." A nice article about ghost stories by C.S. Evans that appeared in The Bookman in December 1919. It was probably the cave man who told the first ghost story, and he almost certainly told it very well, because he believed in it. To him, consciously at war with nature, the presence of an inimical force external to nature seemed an obvious thing, and he evolved his theology from his theories concerning it, just as he evolved his religious ritual from the ceremonies he devised to circumvent or placate it. We men of a later age stand where the cave man did in our relations to the unknown; the same problems that perplexed him perplex us, except that we recognise in them far greater complications and are a little less serious in approaching them. His witch doctors dwelt remote, clothed in awful mystery, with every appurtenance of terror skull and bones and snakeskin and filth about them; ours wear top hats and frock coats and are grocers and other respectable things in the day time. He worked charms with dried blood and potent herbs; our masters of the occult do conjuring tricks with tambourines and Iittle tables. It is, however, to literature that we must turn if we are to realise the essential elements of man's attitude to the unknown. Not merely to the written records of man's experiences and investigations, not to the journals of psychical research societies, which are, generally speaking, inexpressibly dull, but to those imagined things, those “ghost stories" which now and again capable artists give us, and which we read in the profound hope that they are not true. All such stories, all that count at any rate, concern themselves with terror. Their aim is the recherche du frisson, they are the modern counterpart of the ancient witch doctor's hymn to his spirits; they are, the expression of the wild, unreasoning fear that numbs the heart of man when he feels that presently something may spring at him out of the dark. There are very few ghost stories which possess this authentic thrill, and the fashion of them changes, for we are more sophisticated nowadays than we used to be. Our great grandfathers could extract an enjoyable horror from spirits that walked about in moated granges satisfactorily clanking chains. All that these simple souls required to make them happy was a headless horror in a dark passage outside a panelled chamber carrying its eyes in its hand. For such robust susceptibilities Mrs. Radcliffe, the Rev. Charles Maturin and Mary Wollstonecraft Shelley catered; but to day our scepticism of anything so concrete as their phantoms destroys our enjoyment; we must needs dignify our tremors by a quasi scientific explanation. We have classified our ghosts, so that young ladies in drawing-rooms can talk glibly of elementals, poltergeists, etherical projections, Barrovians, Vagrarians, Semi, and all the rest of it, in appropriate jargon. The shortest and perhaps the most perfect ghost story in the world is told by Dr. M. R. James in his " Ghost Stories of an Antiquary.” It is the tale of a woman who was staying in a strange house. She was shown her room; she entered, locked the door, undressed, blew out the candle and got into bed. Then, as she lay there in the dark, came a little, horrible voice from above: "Now we're safely shut in for the night!" . . . If that story does not produce a thrill, no more sophisticated tale will do so. It is the ghost story reduced to its lowest terms the essential ghost story, the effect of which is to rouse those unreasoning terrors which lie dormant in all of us, and which wake to life in the presence of the unknown. There are many ways of sounding these depths of terror. The effective ghost story must be mysterious, yet mystery is not enough. One of the most mysterious things in the world is an equilateral triangle, but only the crazed soul of a Futurist artist is likely to be haunted by a thing like that. The effective ghost story must be horrible, yet horror is not enough; there is a certain horror in the thought of a comet plunging for ever into the depths of space, but the tranquil mind is not disturbed thereby. The horror of the occult must be symbolistic, portentous; it must carry with it a sense of loathing and unspeakable obscenity. The sought for frisson, hardly attained, must be a very shudder of the soul, the awful gesture of life threatened by malign and desolating forces. Masterpieces in this genre are of course very few. One may indeed count them on the fingers of a hand. Some of Edgar Poe's tales ought certainly to be included in any list of the greatest ghost stories, especially "The Fall of the House of Usher," a tale which for sheer concentrated horror is unequalled in literature. The opening passages of that wonderful tale strike upon the consciousness like a knell. Material things dissolve, and one steps across the borderland. Place should be given also to the one or two somewhat more complex and ambitious studies made by Bulwer Lytton, particularly in "Zanoni" and "A Strange Story," but like most of his other work, Lytton's tales of the supernatural are more than a little exotic, and we of the present age may be forgiven if we regard them, as some what pretentious. It is however the modern writer who has excelled pre eminently in the tale of the occult. Dr. M. R. James's "Ghost Stories of an Antiquary," two volumes of which were published by Mr. Edward Arnold five or six years ago, contain some of the eeriest tales ever written. You may sup full of horrors if you sup with Dr. James. He never bothers with the dreary scientific kind of tale, but is frankly at home with medieval superstitions and black magic; his properties are familiar spirits, anthropophagous, with clutching hairy paws, and spiders especially spiders. A cold shiver runs down the spine even when one thinks in retrospect of that horrible old gentleman of his whose face was a mass of cobwebs. Mr. Algernon Blackwood has written a great many stories of the occult but few of them can be classed in the first rank of ghost stories. He began well with “The Whisperer and Other Tales," but some of his later books read like extracts from the proceedings of the Psychical Research Society. He peers forward amiably into the unknown blinking benevolently, and tightly clutching a volume of Bergson. Very different, and far finer from an artistic point of view, are the stories of Mr. Arthur Machen, collected in the volume called "The House of Souls " (published by Grant Richards some years ago, but now, I believe, out of print). Nor must Mr. Oliver Onion's "Widdershins" (Martin Secker) be forgotten, and those masterpieces of Rudyard Kipling's, scattered about in various volumes – “The Mark of the Beast," "They," and "The Brushwood Boy." In a place very little after these I would put three books by William Hope Hodgson, whose pen, alas, is laid down for ever: "The House on the Borderland," "The Ghost Pirates,” and "The Boats of the Glen Carrig." And so we come, by devious degrees, to the supreme masterpiece of all the literature of the supernatural, the story called "The Turn of the Screw," which you shall find in the volume by Henry James entitled "The Two Magics." Fastidious artist as he was, Henry James approached even a conte of the horrible with delicacy. He knew that the crowning horror of horrible things is achieved when they are placed in close juxtaposition with the commonplace, and he knew, too, that the sense of horror is best awakened and maintained by means of a subjective study. “The Turn of the Screw” may be described as the story of the corruption of the souls of two children by malign influences exercised through the spirits of the dead, but it is something far more than this. The significance of it glows and fades, changing with the mood so that, on a second or third reading one wonders whether it is intended as a ghost story at all whether it is not rather a profound study of the effect of fear upon a delicate and sensitive nature. One may never know why the boy Miles left his bed at night to stare in horrible entrancement at that figure on the lawn, or whether the ghost of Peter Quint really walked to work evil. One is not sure whether the girl Flora held fearful communings in the wood with the spirit of the governess, dead and for ever damned, or whether the whole thing was not merely the overstrained imagination of the narrator. In either case, the sense of horror is insistent, and in some obscure way the author has managed to hint at a significance which is revolting and obscene. Outside art, there is another kind of writing of the occult which has become increasingly common in recent years the record of so called personal experience in the realm of the unknown. This branch of literature has a jargon of its own. People do not die, they “pass over," and their spirits hold of telephonic communication with the living through the agency of “mediums,” and with the help of a whole paraphernalia of cabinets am tambourines and ouija boards and planchette. Of all branches of literature there is none that is less calculated to appeal to the imagination than this. It is associated with material accessories which are almost symbolically unbeautiful –oilcloth, and the smell of paraffin oil, cheap American organs and concertinas, stout and stupid middle aged women, Americans with names like Hiram K. Brown, squalor, and confusion, and untidiness of mind. Everybody has seen the kind of book I mean with the portrait of the "subject" in the front looking like the lady who proclaims from the back page of the newspaper, “I had bad legs and dropsical swellings, but Billions' Pills cured me!" In the face of this feeble nonsense the strongest souls turn sceptic, and beside it the witchcraft of ancient days seems a dignified and even a worthy belief. I have said enough about books on the occult to render the detailed reviewing of the newest batch of them unnecessary. “Patience Worth, a Psychic Mystery," by Caspar Yost, comes to us from America and is one of those authentic documents. The less one says about it the better, except that judging from the specimens of Patience Worth's literary exercises, as communicated to the medium and duly recorded, the lady would have done better to have rested mute and inglorious on the “other side." Patience Worth speaks in a kind of debased Wardour Street English which must be distressing to those of her spirit companions whose souls are still sensitive to the beauties of language. "The Ghost World," by J. Wickwar, is a collection of anecdotes of the occult. Violet Tweedale's “Ghosts I Have Seen" is a volume of literary tittle tattle with an occult bias. The author is a daughter of one of the Chambers of Edinburgh, and she has much that is interesting to say, but ghosts must by this time be three a penny in her household. The only thrill I got from the book was produced by the two awful eyes on Mr. Jenkins's wry effective cover. But perhaps the author did not write the book with the object of pleasing epicures in sensation. "The Eternal Question,'' by Allan Clarke, is obviously a sincere outpouring from the heart of a man who has suffered the grief of a great loss; it would he indecent to be flippant about it. And "Voices from the Void." by Hester Travers Smith, is void of any convincing voices. I cannot like these books, but Mr. Edward Arnold has promised us a new volume of the "Ghost Stories of an Antiquary," and already I feel the pleasant shivers running down my spine. . . . There was that horrible creature that moved across the picture to the windows of the house. I shall turn on all the lights before I go to bed. Not in the same literary league as Stefan Grabinski and Hope Mirrlees, but certainly deserving of a note somewhere is British-born author Kathleen Lindsay. Born in Aldershot, Hampshire, in 1903, Lindsay held the record in the 1984 edition of the Guiness Book of Records for having the greatest number of novels published by an author – 904! She wrote under at least eight pseudonyms – perhaps the best known is Hugh Desmond, under which name she wrote 79 crime novels, but also Mary Richmond (113 hits in the British Library catalogue, some doubtless reprints) Molly Waring (73 hits), Betty Manvers (59 hits), Elizabeth Fenton (8 hits), Mary Faulkner (the name by which she is known in the Guiness Book of Records), and Margaret Cameron. She also wrote novels under the name Nigel Mackenzie (43 hits) including the enticing titles, Invasion From Space (1954), World Without End (1955), The Moon is Ours (1958), and The House of Horror (1959). In an interview for an Australian newspaper in 1949 she said that she adapted family names for her pen names - "I just use family names and twist them around a bit" (The Argus, 15 February 1949). Most of her books are crime, romance or historical novels. About 30 of the Hugh Desmond novels feature the series character Alan Fraser, a Scotland Yard detective. Lindsay appears to have started her writing career with Herbert Jenkins in 1931 with It Happened at the Cape (the 1934 Author’s Who’s Who gives her address c/o Herbert Jenkins), but the vast majority of her novels, at least those published in Britain, were published by Wright and Brown. Wright and Brown was one of the publishers whose stock was destroyed during the blitz, and Lindsay later wrote that “during the war I had 15,000 copies [of books] destroyed in one fire” (The Argus, 5 February 1949). Over the course of her long career she also published with Hutchinson, Cassell, Robert Hale and others. Biographical details are slim, but the Australian writers’ database Austlit says was educated privately at the Convent of Sacré Coeur, Paris and the Sakkakini Convent, Cairo. She is also said to have had three husbands, one of whom was Percy Edward Jeffryes, to whom she dedicated some of her books. According to Jeffryes’ military service record in the National Archives of Australia, Jeffryes was born in London in 1893. He signed up for military service in 1916 at Fremantle, Western Australia, and served in France. There is a note in the record dated 1925 that his pension is payable to South Africa, and a 1957 letter concerning his pension to the effect that he is very much in need of financial support. The South African link accords with Kathleen Lindsay because we know that she lived there for some years – the 1949 interview says that she “recently spent three years in South Africa getting material for novels,” and wrote several novels set there. In early 1949 she goes on an extended tour of Australia on the 15,900 ton Shaw Savill liner Gothic, visiting Perth, Western Australia, and Melbourne, Victoria, amongst other places. 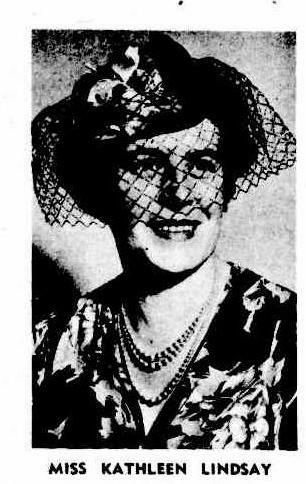 She apparently travelled alone, and newspaper articles give her name as Miss Kathleen Lindsay, so she had either not yet married Jeffryes or had divorced him. She gave interviews on the way and apparently did some useful business – her Hugh Desmond novel “A Cry in the Night”, set in Perth was serialised in the Perth newspaper the Western Mail from September 1949. In the novel, former Scotland Yard detective Alan Fraser helps solve the murder of woman whose body is found in King’s Park. The interviews and articles provide some useful information – that she is writing her 289th book (which makes you wonder if the 904 books mentioned in the Guiness Book of Records is accurate), that she writes 5,000 words a day, and that “until last year, her late father was her secretary and collaborator.” An article also reveals that she would be returning to South Africa where she wants to set up as a publisher – perhaps this firm was the source of most of the further 600+ books she evidently wrote before she died in South Africa in 1973! A forgotten writer about whom a lot more research needs to be done, and it's certainly possible that she used other pseudonyms apart from the eight mentioned here. Hope Mirrlees (1887-1978) is mostly remembered for her fantasy novel, Lud-in-the-Mist (1926), which was reprinted in the Pan Ballantine Adult Fantasy series and gained a new readership in the Nineteen Seventies and after. But she also wrote two other novels, both unusual: Madeleine (1919), and The Counterplot (1924), and historical studies and essays. And she was a poet, her work now gathered in a fine volume, Collected Poems, from the Fyfield Books imprint of the Carcanet Press, edited and with an introduction by Sandeep Parmar. This includes her long modernist poem Paris (1920), full of the restless, vivid and bohemian spirit of the city in the years between the wars, a work too long overlooked, mingling mythic creatures and eternal symbols with the advertising slogans, public captions and overheard sayings of the fervid capital. The poems of her twilight years, also gathered here, are usually less formally adventurous but infused with her original and exotic intelligence, as she invokes the days of the Angel of Dusk. This edition also offers six essays, including a valuable one on A.M. Remizov, the Russian poet and teller of fairy-tales, in exile in Paris (his room was a museum of figurines and strange contraptions). The Collected Poems of Hope Mirrlees is a keynote work for our appreciation of this elusive but brilliant figure, and well-served by a fascinating introduction about her life and books. Hieroglyphic Press have just published a translation (by Miroslav Lipinski) of Stefan Grabinski's first full collection of fantastical and macabre stories, On the Hill of Roses (1918). Grabinski's work has gradually been appearing from independent and small presses over the last couple of decades. This quiet renascence of interest allows us to appreciate the late and strange flowerings of a sombre but exquisite Symbolist. This edition is well-designed, with a beautiful dustjacket appropriate to the title. Mark Samuels provides a brief, affectionate foreword about discovering Grabinski, and the translator a very helpful introduction, explaining just how singular Grabinski was in the Polish literature at the time, and outlining the tragedy of the author's life, and subsequent neglect. The stories will appeal to all connoisseurs of the fantastic and decadent in European literature.